CRETE house, designed by Washington University – St. Louis, placed 10th overall at the U.S. Department of Energy 2017 Solar Decathlon. The team tied for second place in the Architecture Contest and earned fourth place in the Innovation and Energy Contests. 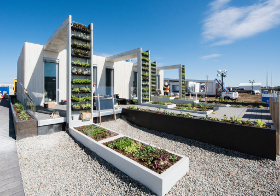 After the Solar Decathlon, the CRETE house went to the Tyson Research Center, a research field about 30 miles from the Washington University campus, says Pablo Moyano Fernández, assistant professor in architecture. As of the fall of 2018, the house was not assembled. “It is uncertain if we will be able to put it together due to budget constraints,” Fernández says. Keep up with the team, which went on to compete in Solar Decathlon China 2018, on Twitter and Facebook.